"E.T. was the death of Atari." If you believe the urban legend, then that game, based on Steven Spielberg's blockbuster movie, is the sole reason Atari flopped in the 1980s. As the myth went, the company, allegedly so ashamed of the game, decided to bury millions of unsold cartridges in the New Mexico desert and cover them with a slab of concrete; a curious tale we now know to be true. Like the oral histories passed down from one generation to the next, though, certain details of the story behind E.T. 's genesis and Atari's demise have been lost along the way, and mild inaccuracies have become fact. To find out what really happened more than 30 years ago, we went straight to the man who made the game: former Atari developer Howard Scott Warshaw. This is his story. By the time he'd been approached to take on the E.T. project in the summer of 1982, Warshaw had been with Atari for some 17 months. During which time, he'd already developed and shipped two games, Yars' Revenge and Raiders of the Lost Ark, almost singlehandedly. The E.T. team consisted of only three people: a graphics designer, a composer for the game's opening song and Warshaw himself. "I did everything else in the game: all the design, all the programming, all the sweating. That was all me," he said laughing. Three decades ago, that was common. Today? Even among the nimble indie scene, that's mostly an exception. As Warshaw explained, under the leadership of CEO Ray Kassar, Atari underwent a transformation from being a technically innovative company to one focused on licensed games. "Once you had that property tie-in, that's all there was to a game," he said. "All you needed was something to stick in a box and sell. Development got shorted." Not everyone could handle that working environment. Warshaw said that he saw more nervous breakdowns in the Atari offices than any place he'd ever worked; something he said was common in software development. "Literally, you'd see vans pulling up to take people away from Atari who'd kind of lost it," he said. "Fortunately, it wasn't 'going postal' types of stuff, but people literally got carted away because they lost their minds at work." Warshaw believes E.T. would have never happened had Atari founder Nolan Bushnell still been running the show. Under that leadership, games were only put to market once they were fun. "There was no pressure to release something," he said. "I seriously doubt that [E.T.] would have been released by QA after five weeks of development." In late summer of 1982, Kassar called Warshaw and offered him the chance to develop the game. Compounding the already tight deadline, Warshaw had a mere two days to come up with the game's design document before presenting it to Spielberg in Los Angeles. "We're presenting the design; I laid out the whole plan and at the end of the presentation, Spielberg looks at me and says, 'Couldn't you do something more like Pac-Man?' I was flabbergasted," he said. "Of all the people in the world, Steven Spielberg suggested that I do a knock-off! My impulse was to say to him, 'Well gee, Steven, couldn't you do something like The Day the Earth Stood Still?' But, you know, I didn't say that. It was Steven Spielberg." "In retrospect, [taking Spielberg's advice] might not have been such a bad idea," he said laughing. Much like today, game publishers 30 years ago had a razor-sharp focus on releasing their titles in time for the holiday shopping season. In a 2005 interview with The A.V. 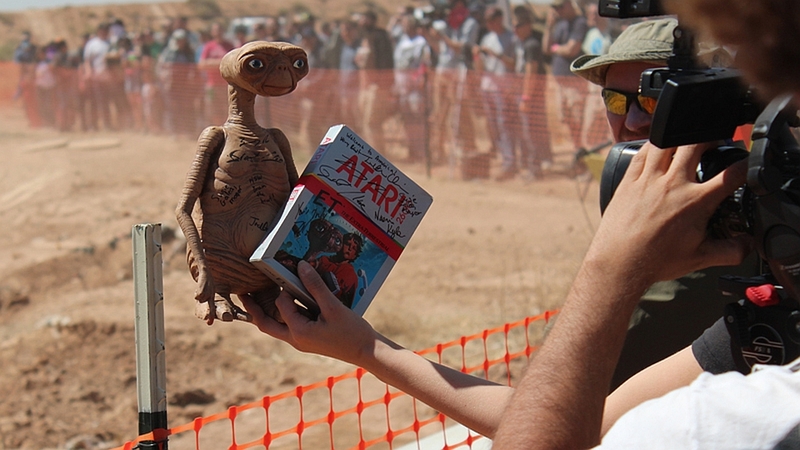 Club, Warshaw said that Atari waited a long time to negotiate the licensing rights for E.T. with Spielberg, and that those talks continued deep into July. The price of that license? Somewhere in the neighborhood of $22 million. Combined with the hard September 1st manufacturing deadline, that left a little over five weeks for development. "E.T. was an emergency situation that the company created," said Warshaw. "They paid too much for the license and left us too little time to do the game." Warshaw said that once development had started, there was jealousy around the office because he'd just come off of working with Spielberg on the Raiders tie-in. During a department meeting on July 26th, 1982, he called everyone's bluff. "I stood up and said, 'E.T. is due September 1st; does anyone else want to do it?' Nobody volunteered." "I laid out the whole plan and at the end of the presentation, Spielberg looks at me and says, 'Couldn't you do something more like Pac-Man?' I was flabbergasted." Crunch period in modern game development can last more than a year, with nearly everyone on staff working 80 or more hours per week to make a game's ship date. Labor can be spread across multiple studios (and sometimes even multiple continents), with entire game features and modes being assigned to different teams to help lighten the load. Warshaw didn't have any of those luxuries. To take advantage of every minute at his disposal, he had a developer workstation installed in his home. He said that he didn't quite work on the game for 24 hours a day, but added that it was an incredibly grueling five weeks of his life. "E.T. was all about the deadline," Warshaw said. "It was absurd." With Raiders of the Lost Ark, he had nearly nine months of development time. E.T. had to be done in just a fraction of that. Instead of panicking, though, he treated his schedule as a design problem. "You don't try to do a six-month game in five weeks," he said. "When I accepted the challenge, I designed a game that could be done in five weeks -- there is much debate about the playability." Delaying a game to ensure a quality release was not par for the course at Atari. Profits, on the other hand, were. Tepid consumer reception, coupled with a reported 2.5 million (or more) unsold cartridges, meant that Atari had a lot of excess software on its hands. That December, Kassar dumped 5,000 shares of company stock mere minutes before Atari issued a press release stating that fiscal results for the year were "substantially" below expectations. The company posted a $310.5 million loss in 1983's second quarter, and it took until September of that year for the SEC to charge Kassar for insider trading. The day after the ruling, The New York Times reported that spectators were kept at bay as Atari dumped 14 truckloads of game carts and equipment into the Alamogordo, New Mexico, landfill and covered the pile with cement. "[E.T. 's] certainly not the sole factor that played into the failure of Atari," Warshaw told us. "It was a byproduct of the philosophies that created Atari's failures." "You don't try to do a six-month game in five weeks. When I accepted the challenge, I designed a game that could be done in five weeks." Until this week, not even Warshaw believed that Atari's silicon mass grave was more than a rumor. "It doesn't make any sense, but as soon as you come from a place of making sense, you're losing touch with Atari," he said, laughing. "What company in financial trouble does that? That's why I always figured it wasn't there." Warshaw didn't need closure from the excavation; he'd already gotten that when he finished the game. His reaction to the discovery of the E.T. trash heap, though, was one of joy and satisfaction. "Something I'd done 30 years ago is still generating interest and discourse today – that feels very special." Since parting ways with the company in 1984, Warshaw's made several documentaries (including one about Atari, naturally), written books and even had art featured at the Museum of Modern Art. These days, he's a therapist in Silicon Valley, a job he says is the first one he's loved in 30 years. "It all comes full circle, right? I used to entertain a lot of these same people. Now what I really enjoy is helping them with their lives," he said. Had E.T. not flopped, Warshaw said that he'd have been at Atari "as long as there was an Atari to be at." "People think I should be ashamed of E.T. or recognize what a failure it is, but honestly I've always seen it as an achievement."